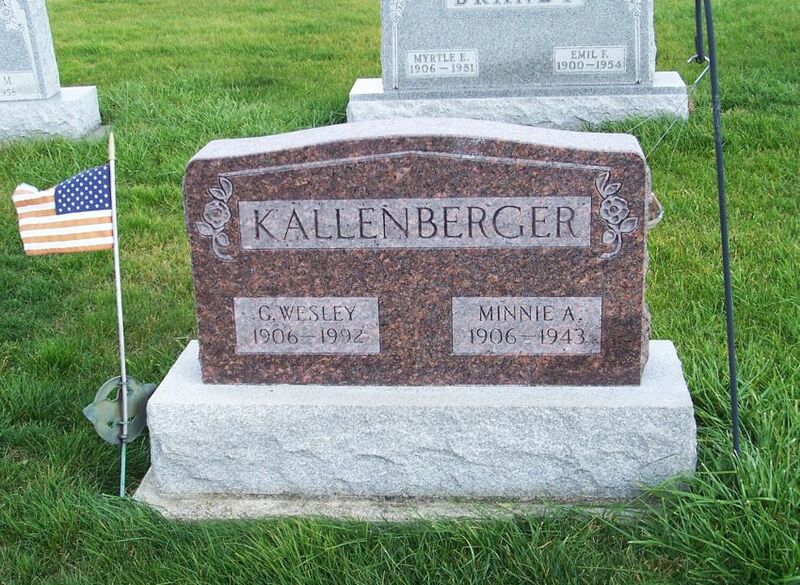 G. Wesley & Minnie A. Kallenberger, Zion Lutheran Cemetery, Chattanooga, Mercer County, Ohio. 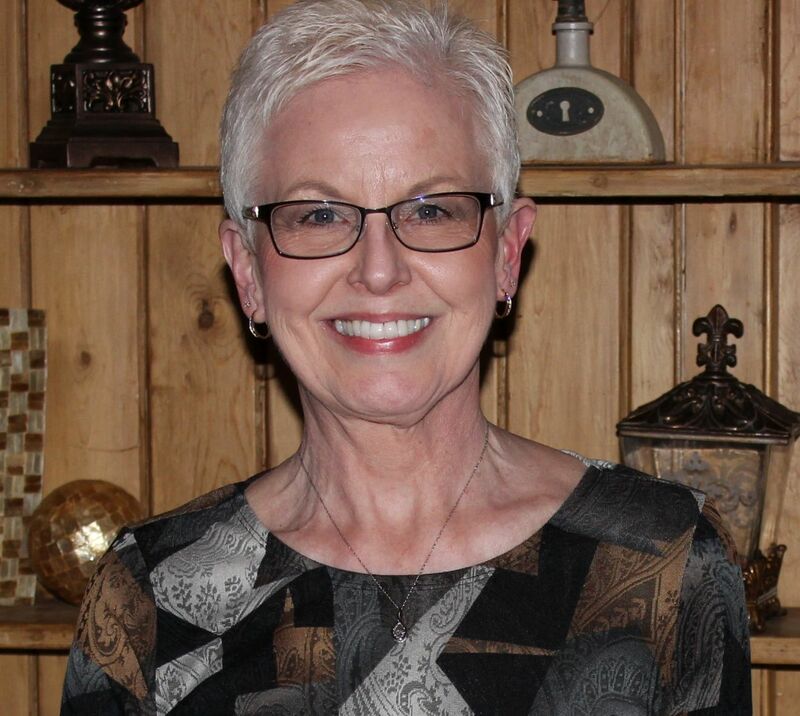 Funeral services will be held at 2:30 o’clock (EST) this Thursday afternoon from the Zion Lutheran church at Chattanooga, for Mrs. Wesley Kallenberger, with interment in the church cemetery. Mrs. Minnie Arbada Johnson Kallenberger died at the home of her father, Rev. W. Frank Johnson, seven miles east of Berne at 9:50 o’clock Tuesday morning. She was 36 years of age. Minnie, Wesley, Max, Jean Lavon & Don Kallenberger. George Wesley “Wes” Kallenberger, 85, 425 Grant St., Decatur, Ind., died at 10:15 a.m. Monday in Adams County Memorial Hospital, Decatur, Ind., where he had been a patient since Dec. 31. He had been ill for the past eight years. 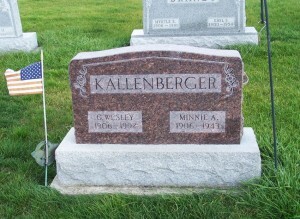 Born in Arcanum May 4, 1906, he was the son of Michael and Margaret (Miller) Kallenberger. He was married Nov. 18, 1934, to Minnie Johnson, who died Feb. 16, 1943; on Feb. 1 1947, he married Alice Lucille Stager Clark, who survives. Also surviving are two sons, Max Kallenberger, Lancaster, Calif., and Donald Sausaman, Chicago; two daughters, Mrs. Bill J. (Jean Lavon) Ross and Mrs. William (JoAnn) Karbach, both of Decatur, two step-sons David “Nellie” Clark, Decatur, and Ralph Stager, Lima; a foster brother, John Kallenberger, Willshire; and 11 grandchildren and six great-grandchildren. 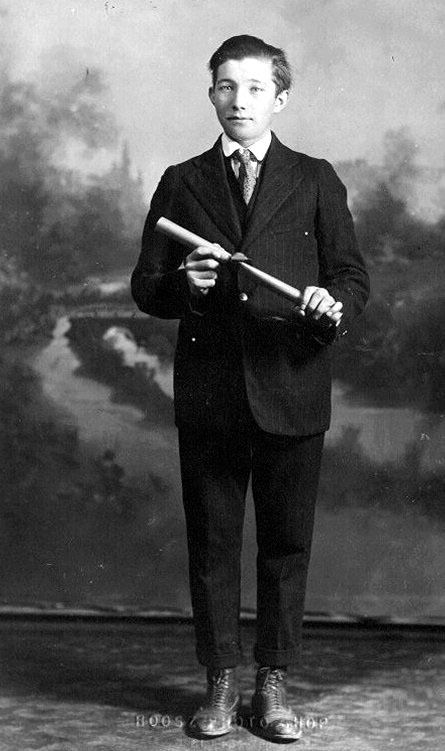 He was preceded in death by a foster sister, Ardella Hamrick, and a half-brother, Ralph Grove. Mr. Kallenberger retired from Central Soya in 1971 after 33 years of service, and he was a former employee of Wayne Novelty. He also was a World War II veteran, serving in the South Pacific Theater in the Navy Seabees, and a member of Zion Lutheran Church, Decatur, and Adams Post 43 of the American Legion. Services will be held at 10 a.m. Thursday at the church, the Rev. Donald W. Biester officiating. Burial will be in Zion Lutheran Cemetery, Chattanooga, with complete graveside military services by the American Legion. Friends may call 2-5 and 7-9 p.m. Wednesday at Zwick-Sefton & Jahn Funeral Home, Decatur, and after 9 a.m. Thursday in the church. Wes Kallenberger and my dad were first cousins and I think they knew each other fairly well. 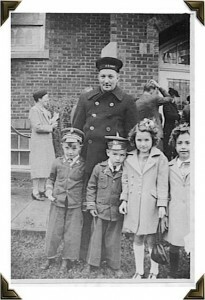 My dad had several photos of Wes and his family and I have included a couple of them here. Minnie died leaving three young children during the time our country was in the middle of WWII. 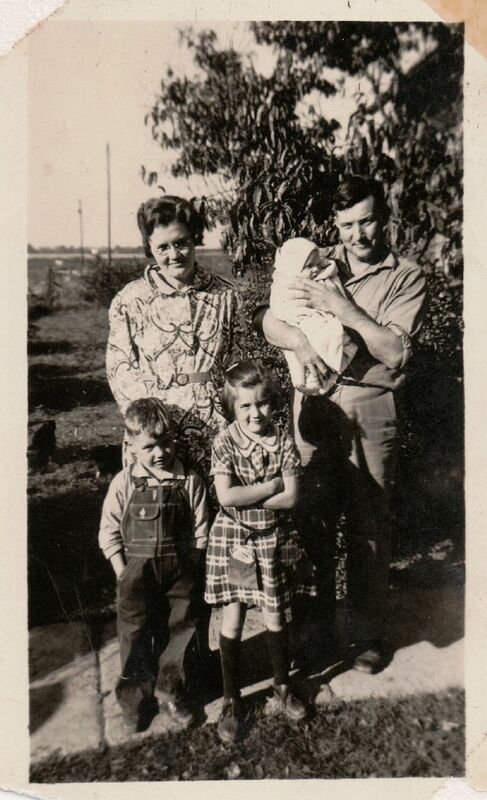 Wes was drafted and served in the Seabees while relatives took care of their children. The Willshire Herald, Willshire, Ohio, 18 Feb 1943, p. 1. Interesting that the obit. listed Wes as my grandparents’ son even though he was adopted, yet referred to his real birthplace, yet leaving out his birth parents. Max lived with my Grandparents also until he joined the navy. Not sure whether Max now lives in California or Nevada. He tried Tenn. recently but needed to get back to more comfortable territory. Never have understood how the second wife had Wes buried beside his first wife. Lots of mysteries. Obituaries are not always 100% accurate. I think it is rather common for first spouses to be buried together, even though there was a second marriage. I believe this was a second marriage for his second wife Alice. Perhaps she is buried with her first husband?